How many times have you popped the batteries out of those old smoke detectors when the alarm blasted over burnt toast…and then failed to put the batteries back in? Or how about not replacing the batteries when they die or checking to see if the alarm is still in working order? Is there even a smoke detector in the house? Well folks, if you live in California, the law has been mandated for your safety! As of July 1, 2014, any battery-powered smoke alarm or combination (smoke and carbon monoxide) alarm approved for sale by the state fire marshal must be powered by a sealed, 10-year battery. 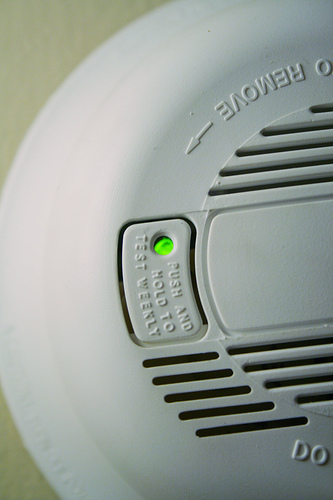 The law also requires that, effective January 1, 2015, retailers must have stocked only sealed-in, long-life battery smoke alarms, and all new smoke or combination alarms must display the manufacture date, provide a place on the unit to mark the date of installation, and incorporate a “hush” feature to silence nuisance alarms like those caused by burnt toast or shower steam. That’s fantastic news, especially considering two-thirds of all house fires occur in homes that either don’t have a smoke alarm or that have one that isn’t working due to dead or missing batteries. A long-life battery, sealed inside an alarm, makes it virtually tamper-proof and eliminates the risk associated with disabling the alarm. Yes, great news for Californian’s indeed! It’s also a great reminder for anyone living anywhere; regardless of the law, it is always a good idea to pay attention to the operating life of your home smoke detectors and/or combination alarms. For more information on the requirements for smoke alarm listings as outlined by the California State Fire Marshal click here.